Croatian-born Radovan Vlatkovic renders divine sounds from the notoriously difficult French horn. The French horn is the easiest instrument in the orchestra. It practically guarantees a gorgeous tone to anyone pressing his or her lips to the mouthpiece. So securely and evenly placed are the pitches in its range that it's hard to miss a note. If you believe the previous three sentences, you either have never actually heard the horn, or you were lulled into a delicious delusion Thursday night by Radovan Vlatkovic in recital with pianist Ieva Jokubaviciute. 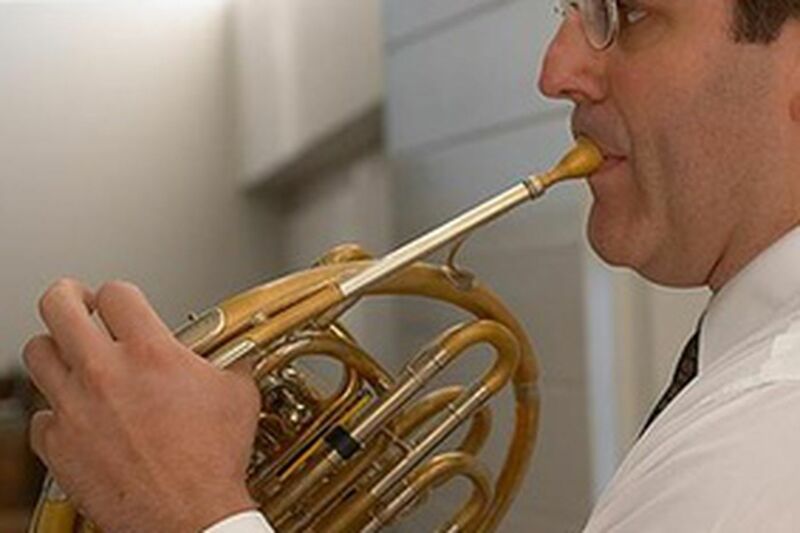 It's not just that the Croatian-born hornist, a professor at the Mozarteum in Salzburg, has fabulous chops or a luxurious tone that makes him so extraordinary. What sets him apart is his possession of these preternatural abilities plus the fact that they are merely a springboard for his artistic agenda. The horn is one of the least evolved of familiar European instruments. Its source is naturalistic (think hunting horn, ram's horn), which makes it both charming and treacherous (we'll leave it to hornists and oboists to wage their ongoing pity party over who has the tougher instrument). Paul Dukas' Villanelle for horn and piano is a common showpiece for students, but here its value multiplied ten-fold as the perfect union of repertoire and performer personality. Vlatkovic never let you forget how wild those fanfares can be; he has a generally loud sound and is expressively adventurous. But his tone is extremely refined (he plays a Paxman, an English instrument known for its mellow flood of sound), making this Villanelle an act of bringing something in from outdoors and taming it. Other works in his program at the smallish Benjamin Franklin Hall of the American Philosophical Society referred even more explicitly to nature. Richard Strauss' Das Alphorn, in which Vlatkovic was joined by soprano Hyunah Yu, "resounded from the hilltops," and from "a valley's flowery meadow." Yu is a polished and intelligent singer, though her artistic presence was but medium-sized next to Vlatkovic's. Their partnership was similarly lopsided in Berlioz's Le jeune pâtre breton and Otto Nicolai's Variazioni Concertanti on a theme from Vincenzo Bellini's La Sonnambula. A few listeners shifted impatiently in their seats after the first few notes of Messiaen's Appel Interstellaire for solo horn. Dating from 1971, it sounds every bit its age - experimental, scrupulously unmelodic, slightly arbitrary. It uses a small vocabulary of caustic techniques: stopped notes (jamming your hand up the bell of the horn to produce an edgy, buzzy muted tone); flutter tongue (a machine-gun-like interruption of the sound produced by pushing your tongue forward and letting it roll); and very fast chromatic flourishes. But it's a brief work, and all the more alluring when you realize that it was inspired by the American canyons - another bit of the horn bringing nature indoors.